On 22 August 1485 Henry Tudor’s army defeated Richard III at the Battle of Bosworth. Henry was of a Welsh lineage – his grandfather, Owain Tudur, belonged to an Anglesey family which had played a prominent part in Welsh politics since the days of Llywelyn the Great (1173-1240). Henry’s victory was interpreted by several commentators at the time as a victory for the Welsh nation. At last, a Welshman sat on the English throne, and it was hoped that the penal laws against the Welsh people, passed as a result of Glyndr’s war, would now be repealed. In 1536, under Henry VIII, Henry Tudor’s son, civil rights were indeed restored to the Welsh, but at the expense of incorporating their country into the English state. In the words of the Act of Union, Wales was to be ‘for ever and henceforth incorporated and annexed in this our realm of England’. The old laws of Hywel the Good were to be abandoned, and the Welsh language – ‘a speech nothing like, nor consonant to the natural Mother tongue used within [this] realm’ – was not to be used for any legal, administrative or religious purposes.  At about the same time, of course, the monasteries – some forty of them in Wales – were dissolved; the Pope’s authority was rejected and the Church became the Church of England. 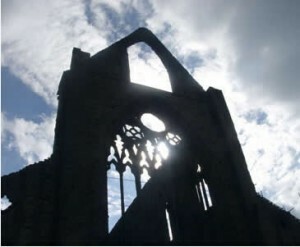 From now on, the intention was that English would be the language of law, administration and religion in Wales. It would be wholly correct to say that it was the Church – more, perhaps, out of zeal for evangelising than out of zeal for the language itself – that saved the Welsh language at this time. A number of church leaders realised that the new religion would never succeed in Wales unless it made provision in the language of the people. In 1551 William Salesbury published his translation of the readings in the Book of Common Prayer from the gospels and the epistles. In 1563, together with Richard Davies, the Bishop of St.Asaph (1560-61) and later St.David’s (1561-81), he persuaded Parliament in London to authorise a translation of the Bible and the Book of Common Prayer into Welsh. In 1567 Salesbury published his own translation of the Book of Common Prayer and the New Testament. 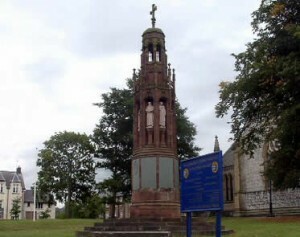 Richard Davies, who had assisted him with the translation of the New Testament, wrote an introduction to the work in which he argued that the new Protestant religion restored to the Welsh people their ancient Church, a Church unsullied by Rome, which had been lost in the year 777. In 1588 William Morgan, the Bishop of Llandaff (1595-1601) and later St.Asaph (1601-04), published the entire Bible in Welsh, having revised Salesbury’s translation of the New Testament and translated the Old Testament himself. 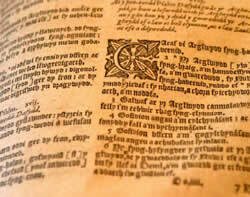 The Welsh Bible had enormous influence: it established Protestantism among the Welsh people; it preserved the high standard of written Welsh that had hitherto been the concern of the bards, and saved the language from deteriorating into a number of unconnected dialects; and it laid the foundations on which all the Welsh literature of the succeeding centuries was built. William Morgan’s Bible was revised for a new edition in 1620 by one of the foremost Welsh scholars of the Renaissance, Dr John Davies (c.1567-1644), the Rector of Mallwyd from 1640 until his death. John Davies’ version was, to all extents and purposes, the version of the Welsh Bible that was used until 1988, when the New Welsh Bible was published. Other important works by this able cleric were his Welsh grammar in Latin, Antiquae Linguae Britannicae … Rudimenta (1621) and his Welsh-Latin Dictionarium Duplex (1632). To the same period belongs Edmwnd Prys (1543-1623), who was appointed Archdeacon of Meirionnydd in 1576. He was proficient in eight languages, including Hebrew, and was a competent poet in the traditional Welsh strict metres. He is remembered in particular for his Welsh metrical version of the Psalms, which he published as an appendix to Dr John Davies’ revised version of the Book of Common Prayer, which appeared in 1621. Prys’ Psalms are popular to this day among Welsh-speaking congregations. What do you think would have happened to the Welsh language if the Bible had not been translated into it?